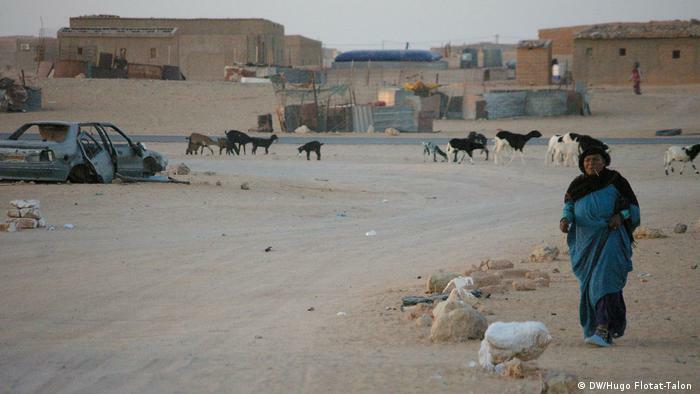 Awserd is one of five camps in Algeria where Western Sahara’s refugees and their descendants live. The Algerian provincial capital of Tindouf is 40 kilometers (25 miles) away. 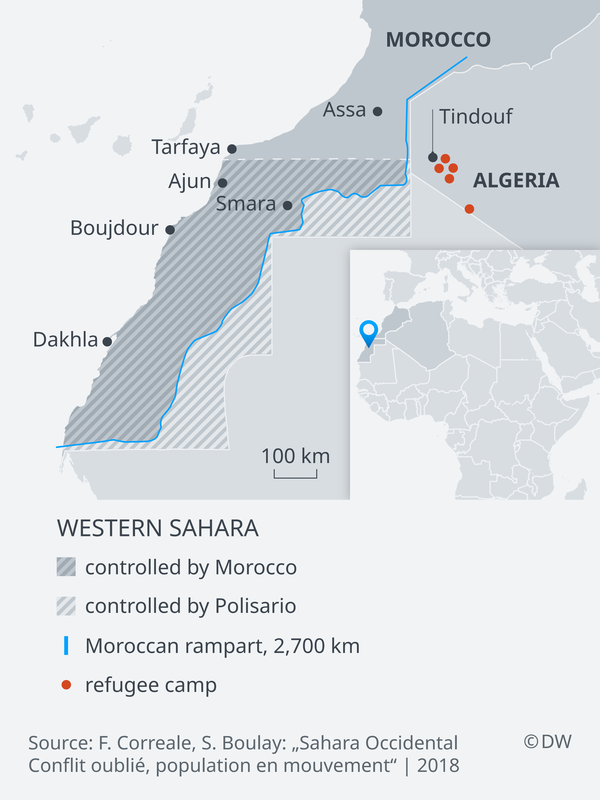 Also nearby is the headquarters of the Polisario Front, which has for decades been fighting for the independence of Western Sahara. Morocco annexed the former Spanish colony in 1975 and bloody civil war ensued. A ceasefire has been in place since 1991 but the conflict remains unresolved. Awserd alone houses some 50,000 people – in tents, mud shacks and brick houses. Omar lives with his parents and five siblings somewhere between the camp’s areas two and three. People in the camps have tried to make the best out of their situation. They set up their own city quarter, communities and regions. Schooling, health care and the distribution of relief supplies has to be organized. The camp has been in existence since the outbreak of the civil war. Now, after more than four decades of conflict, hopelessness is spreading, Awserd governor Mariem Salek Hamda told DW. The food aid supply has declined, infant mortality is double that of Europe, and water is limited to 10 liters (2.6 gallons) per day. “The youth is in despair because in this situation, in which we are for more than 43 years, they see no light at the end of the tunnel,” Hamda says. She points to the ceasefire of 1991. AUnited Nations missionhas since been monitoring the zone adjacent to Morocco. 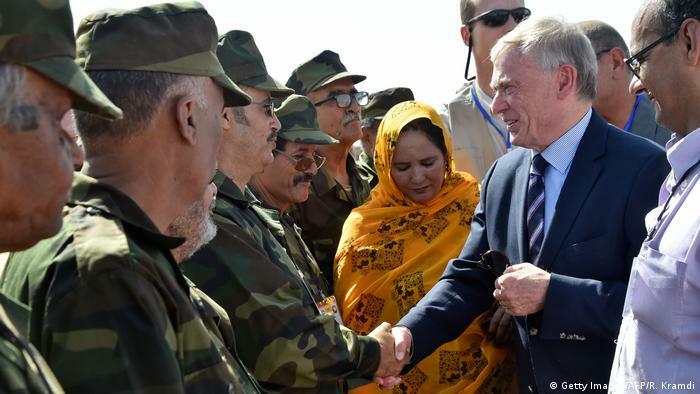 It should actually be overseeing a referendum on independence for Western Sahara. “But since1991 the young people born here see no solution on the horizon. With this standby situation of 27 years – with no peace or war and doubt and mistrust of the UN – this situation arises in the occupied areas. One hears daily about a mother, sister or brother being kidnapped and abused. All this breeds dissatisfaction that can lead to anything,” Hamda says. Some people in the camps make no secret of where the dissatisfaction can lead. Among them is Addou al-Hadj who leads tours at the Museum of Resistance in the nearby Smara camp. “We are tired of waiting,” he says. It is this tension that representatives of the Polisario Front took with them to the resumption of negotiations in Geneva on March 21, 2019. Lead negotiator is Horst Köhler, Germany’s ex-president and UN special envoy for Western Sahara. An offer from Morocco is already on the table: The kingdom wants to grant Western Sahara autonomy. Despite numerous requests by DW to the Moroccan embassy in Berlin, an interview did not come about. Mohamed Salem Salek, the foreign minister of the government-in-exile, knows that. His office is half an hour’s drive from Awserd, in Rabuni – the seat of the Saharawi Arab Democratic Republic. As night falls in Awserd, Omar makes his way home from the little grocery business where he sells water, a little meat and tea to those who can afford it. His eyes wander to the starry heavens. “The most beautiful sky in the world,” he says. All the same, he sometimes dreams of going far away, to Europe. He has lived many years in difficult conditions, he says. His children should have a chance of living a normal life.